Containment was a United States’ government foreign policy strategy during the Cold War period. It is also known as the Truman Doctrine of 1947. It was in the wake of the ideological conflict between the US and the USSR, that President Truman of US followed a series of foreign policy series aiming at curbing the spread and influence of Communism around the world. The situation of that time was such that US and USSR were both skeptical of each other. This policy was a response to USSR’s decision to expand its communist influence in parts of Eastern Europe, China, Vietnam and Korea. The idea of containment was first articulated by a US diplomat George R Kennan in an article contributed to a journal Foreign Policy in 1946 which came to be known as the famous ‘X Article’. The United States’ containment policy also included the formation of NATO. President Truman of America sent an important message to the US Congress in 1947 which contained the ‘policy of containment’. The policy was aimed at limiting or containing Communism so that it would not reach further beyond. This was in response to the conflict in Greece and Turkey in the aftermath of Second World War. As the events in Greece and Turkey turned towards a hotbed, President Truman found it necessary to implement the ‘X Article’ plans of containment. In Greece, the guerilla tactics by the Leftists to overthrow the government were beginning to threaten the government and freedom. Britain was unable to control the situation. Then the US was called to intervene in their action. In Turkey, the Soviets were putting pressure on the Turkish government to redraw the boundaries to gain access to a stronger position in Straits of Bosphorus and Dardanelles which had been under the Turkish control since 1936. During the Second World War, UK backed the Soviets in this regard but when Cold War approached, UK fundamentally changed its stand. Situations in these two countries were the immediate provocation to issue the policy of containment. In view of this, Truman declared in March 1947 “I believe that it must be the policy of the US to support the free peoples who are resisting subjugation by armed minorities or by outside pressures”. This came to be known as the Truman doctrine which aimed at stopping Soviet expansionist activities by intimidating with military arms. The US government decided to extend financial assistance up to 400 million dollars to Greece and Turkey immediately. Thus, the doctrine was to be applied both against the guerrillas (armed minorities and Leftists) and foreign interventions (outside force). Truman was successful in convincing the US Congress and immediately sanctioned the assistance thus, approving and implementing the policy of containment. This doctrine gave a message to the European nation that they could rely on the US and was seen as a stern warning against the USSR to behave. His announcements were clearly anti-Soviet. Later, the doctrine was bitterly criticized as an American form of imperialism. The result was disastrous for the whole world. Soviets did not succumb to its bully but were more aggravated by the policy. The terms ‘aggressor’ and ‘imperialist’ began to be used frequently by the Soviets to describe America. The American Secretary of State George Marshall announced a plan in a speech on June 5, 1947, at Harvard University. While the Truman Doctrine was aimed at targeting containment policy in Greece and Turkey, the Marshall Plan clearly had no military connotation. George Marshall depicted a very depressing picture of Europe. He explained that the region was suffering from a series of problems like acute food shortage, no goods to be exchanged for the farmers etc. During this time, the international Communists were able to muster support in Europe, especially in Belgium, Greece, Italy and Hungary. Also, there was economic instability in these countries due to financial fluctuations. Therefore, in order to ward off Communist influence and to bring about economic stability in the area, the Marshall Plan was announced. The plan proposed economic assistance from the US to prevent ‘economic social and political deterioration for a period of 3 to 4 years. The plan envisaged that the initiative had to come from Europe and should be a joint program of all European nations. The only difference between the Truman Doctrine and the Marshall Plan was that this plan was aimed at assisting every country which needed help be it the East or the West. The plan has rejected the Soviet on July 2, 1947. Initially, some of the east European states like Poland and Czechoslovakia agreed to attend a meeting convened by UK and France to discuss the American aid but then they later rejected the idea under the influence of USSR. Later, the Marshall Plan was eventually translated into the European recovery Program. All the European member states agreed and signed the agreements with the US to gain economic assistance and other related matters. As a result, in 1948, the US Congress passed the Economic Cooperation Act with an initial aid of 5.3 billion dollars and established the Economic Cooperation Administration. After enforcing the ‘US Containment Policy’, a military pact was formalized between the US and several European countries. Already, the relationship between the US and the West European countries were close, but it was the first time after the wars that the US entered into a military alliance with countries outside the Western hemisphere. There were series of treaties that were signed which finally resulted in the formation of NATO. The first step was the signing of The North Atlantic Treaty which is essentially a military pact against the Soviet. 19 Pan American countries signed the treaty in August 1947. This pact formed an understanding that any attack against any member state would be considered an attack on all American States. President Truman explained that this was a necessary step in the formation of a ‘New World’. The second step was the signing of a 50-year treaty of alliance between Britain and France at Dunkirk in March 1947. It was a joint ‘self-defense’ treaty to help each other in further possibilities of attack by Germany. In the third step, the Brussels Treaty was signed between Britain, France, Belgium, Luxembourg and Holland in March 1948. It was also to last for 50 years which aimed at collective military aid and social and economic cooperation.in 1954, it was also joined by Germany and Italy which came to be known as the Brussels Treaty Organization. Initially, the US was not too keen in meddling issues in European region but certain political developments in early 1948 changed the scenario. There was an agreement between Finland and the Soviet which resulted in a coup in Czechoslovakia. US military Governor Clay was skeptical of these events and warned that a Soviet-Finnish type of agreement could be the future of Norway also. In 1949, there was a great cause of Berlin Blockade by the Soviet Union. It was in this backdrop that the NATO was signed In April 1949 at Washington DC by 12 countries which included Britain, France, US, Canada, Luxembourg, Belgium, Denmark, Norway, Portugal, Italy, Netherlands and Iceland. This was signed after consulting Article 51 of the UN Charter. NATO much like the earlier treaties aimed at giving financial and military aid to each member countries and monitor political independence, and territorial integrity of the signatories. An attack on any one of the signatories would be considered an attack on all of them. This meant the use of military armed forces for collective defense and to assist each other. Turkey joined in 1952 and West Germany joined in 1955. The formation of NATO was seen as an act against the Soviets and warning by the US of its preparedness to resort to military confrontation, in necessary, for the defense of the ‘free world’ and to defeat Communism. It sought to expose the evil Eastern Bloc. The Soviets were obviously threatened and called the US with terms like ‘aggressor’ and criticized it for its imperialistic policies. Further, the international community was deteriorating, the Soviets in response formed the Warsaw Pact which further intensified the division of the world into two ideological blocs. Hire the best online political science and international relations, online tutors. 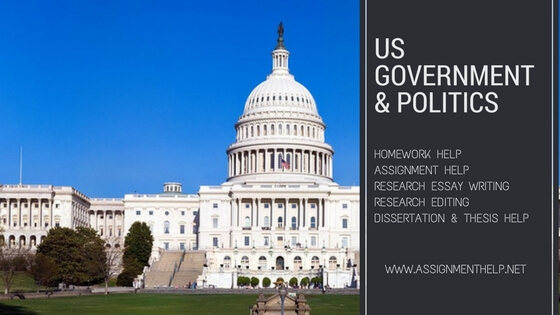 Whether you are stuck with your AP US Government and politics preparation, need help in writing a politics research essay for your assignment, want an excellent political science tutor to clarify doubts and answer questions on international relations or want help with political science dissertation and thesis research writing work; assignmenthelp.net has the best political science and international relations homework help tutors available for you.